Alien vs. Predator, released in 2004, represented the culmination of a number of years worth of work by Hollywood insiders to bring two popular franchises together on the big screen. Driven by the popularity of the Alien vs. Predator comic book and video game series, this was a movie that Hollywood simply had to make. It's too bad it turned out the way it did. The movies have had a love/hate relationship with comic books for many years. For the longest time, Hollywood seemed to be of the opinion that "comics are for kids" and most movies that were based upon comic material were less than the best Hollywood had to offer. Movies like Captain America and Supergirl represent some of the worst comic book based films ever made, and there wasn't much of anything in the success column until X-Men was released to rave reviews and commercial success. Hot on its heels came Spider-Man and its sequel, and finally a masterpiece was realized in Robert Rodriguez's Sin City, based on the popular Frank Miller property. It seemed that comics had turned a new leaf in the movies as Hollywood now spends some time on scripts, effects, cast, and everything it takes to make a good movie. Unfortunately, not all of these are good. Ang Lee's vision of The Hulk left plenty to be desired, as did Fantastic Four and, the case in point, Alien vs. Predator. Director Paul W. S. Anderson, one of the biggest hacks to ever hoist a camera (his list of credits include such lackluster pictures as Event Horizon, Mortal Kombat, Resident Evil, and Soldier) was given the reins of this movie because, apparently, in the darkest corner of Hell there is a contract inked in blood bearing this guy's name. This may be the high point of his career because he was given the opportunity to spread his foul stench on two beloved movie franchises and one of the most popular comic series of all time simultaneously. Somewhere Satan is laughing. A billionaire industrialist named Charles Bishop Weyland (Lance Henrikson - catch the "Bishop" and "Weyland" references; Henrikson's character in Aliens was called Bishop, and the "Company" Ellen Ripley worked for was the Weyland-Yutani Company) believes he has discovered an ancient temple which pre-dates the Mayan, Egyptian, and Aztec civilizations, but which combines features familiar to all three, buried in a glacier in Antarctica. Weyland assembles a team of scientists to unearth and explore the structure and we, the audience, know right away that probably only one of these people will be coming back out once they enter. Once inside, the team discovers a bizarre "sacrificial chamber" complete with mummified corpses. The corpses have death wounds visible in their chests, but they look more like something came out of them rather than the type of wound that might be made by a dagger plunging in. The scientists are perplexed, but the audience knows exactly what killed these people - especially since all the corpses are not human. There are also the remains of several "face huggers" lying about. Apparently Ellen Ripley died in vain in Alien 3, trying to keep the aliens off Earth. They've been here for centuries. They are not running things; however, they are part of a larger plan. Through the course of the story, we learn that the temple was used in ancient times as the scene of a coming-of-age or rite-of-passage ritual for the Predators - the same race of hunter aliens which gave Arnold Schwarzenegger so much trouble in 1987's Predator. The Predators show up, an apparently eternal Alien Queen starts pumping out eggs, and a good percentage of the scientists find themselves as hosts for aliens. The hunt is on. The silliness that ensues is basically a mass of scenes in which Predators and Aliens are busy ripping each other apart. The Alien Queen, as one would expect, tires of being present just for the Predators' ritual and breaks her bonds to join the fray. The remaining humans, caught in the middle, drop like flies until only the Wise Young Scientist (Sanaa Lathan, one of the few good things about this movie) remains. She befriends one of the Predators and manages to stay alive to see the end credits. 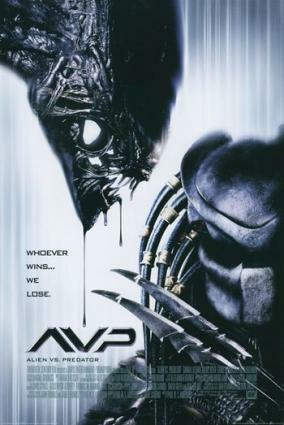 If Lathan's performance is one of the best things about AVP, one of the worst must be that a sequel is in the works. Fox has announced plans to release Aliens vs. Predator 2 in 2007. Remember, "no matter who wins...we lose."